As the list of cars I love but will more than likely never own go, the RX-7 Fortune made famous by Tokyo Drift shares the pole position with the R34 Skyline. The body kit on this car is worth nearly as much as my entire current car, never mind including the price of the base RX-7 you’d be slapping the kit on, along with all the painting, body work to make the kit fit, wheels, coils, etc., and that’s without even touching the engine. It’s an extravagant, expensive, and wildly unique body kit for one of Japan’s most iconic sports cars, yet no actual 1/24 plamo is available as far as I’m aware. As such, for the first time I’m forced to turn to a Chinese company called EightyOne, who made a resin transkit for the Fortune. For those unfamiliar, a transkit is usually a resin car body that goes over the original chassis and interior. This means that I still needed a Tamiya RX-7 to build my Fortune. But like the Eunos Roadster (Miata) that I built before, this isn’t the Mazda RX-7. It’s the Efini RX-7 – another subbrand of Mazda that it rocked in the 1990’s, being the “upscale and luxury” division versus the Eunos “fun to drive” brand. The only difference is that this kit doesn’t come with Mazda badges, and is exclusively right hand drive. Similarly to the Miata, an actual Tamiya Mazda-branded RX-7 kit is available, but it’s pricier and includes a motor, whereas this one only has an empty bay. I was really surprised to see that the body came in red. Kit bodies will usually come in white or maybe silver, but seldom will they actually be color molded. This entire body shell will be tossed back in the box and unused; while the Fortune kit builds upon the stock body in some areas in real life, it’s simply more practical to replace the entire shell on the kit rather than make you cut up fenders and doors to bolt on a body kit. It’s a very sparse kit. Just building this out of the box would be a bit underwhelming, I suspect. Aoshima offers many more RX-7 variations with all sorts of add-ons and motor options, but the particular transkit I’m assembling calls for the Tamiya model, so we’re using that. I’ll still be using the windshield and side window pane, but the rear windshield won’t be used thanks to the Fortune’s redesigned rear deck. The resin body was super cool to open up and check out for the first time, if only because this was the first time I got to see the RX-7 Fortune body in physical form. Now, I’ve never actually worked extensively with resin (I’ve only had experience building a resin GT Wing before, which was also from this company EightyOne) so diving headfirst into an entire transkit body without having significant experience with the material may seem hasty. It’s super interesting being able to put the transkit body next to the stock plastic shell. The difference in width is absolutely bonkers; the only areas that are actually the same in shape are the A and B pillars, along with the door handles and roof. Beyond those parts, you’d never be able to peg it as an RX-7. There are of course more parts to the transkit than just the shell; the hood, sideskirts, wing, taillight cover, and mirrors are all given separately. A neat little bonus is that EightyOne includes two motor sets in every Fortune transkit – one is of the RX-7’s stock 13B engine, while the other is the racecar-only 26B (from what I understand it was used only in Mazda prototypes and competition cars, featured individual throttle bodies, and made an insane 700hp). EightyOne throws in a pair of Recaro SPG bucket seats and even a racing wheel to boot. And because everyone only knows this car from Tokyo Drift, it of course had to include the proper wheels that Han ran in that movie. These 19″ Work Equips are two-piece, with of course deeper dishes for the rear, though their actual tire width remains the same. The tires are also resin casted rather than traditional rubber. Now, I may not be very experienced working with resin parts, but it’s common knowledge that you can’t expect these pieces to come as crisp as plastic parts do. Flash (extra bits of material leftover from the casting process, sort of like nubs) is an expected and normal side effect of resin, and usually it’s easily remedied by just cutting the offending bits off and sanding the rest of the piece smooth. There are bits of flash on EightyOne’s pieces that are highly egregious though – that giant block sticking out of the lower bumper was so ridiculous that I actually questioned if it was part of the original mold at first. The stuff is thicc and extremely difficult to cut with just an exacto, so I had to bust out the heat knife to take it off. After the large flash bits were cut off and removed, it was just a matter of checking things like hood and skirt fitment and adjusting accordingly by wet sanding them down. Common wisdom with resin is to always wet sand so the harmful resin particles get trapped in the water and don’t find their way into your lungs. The resin tires also had some pretty bad resin nubs that had to be removed. I didn’t feel like sanding them smooth since the ragged side could just be oriented inwards so they weren’t seen. Now while the resin body would mostly be a direct replacement, some slight modifications will still need to be made to the chassis and other stock parts. The stock tail lamp lens won’t be entirely used; EightyOne calls for them to be cut at the ends so the clear middle bar will be thrown out. The chassis had the car’s original lip molded in, so to accommodate the Fortune’s new front end, that had to be cut off. Test fit with the resin body on the plastic chassis. It’s nice to see EightyOne replicating the connection point from the original plastic body perfectly, so the chassis slots right in on the inside of the rear bumper without hassle. Gluing the side skirts on before painting. It would actually make it easier to paint the main body and side skirts separately and then assemble them at the end, due to the body’s two-tone paint scheme, but I didn’t want to deal with possibly messing up the paint finish with glue later. Really weird to see the exhaust molded in red too. Such a dinky tip! The giant muffler actually gets in the way of the thick body mold of the rear bumper and fenders. EightyOne mentioned nothing of this in their guide for parts to be modified, and didn’t include any extra exhaust pieces. So I guess it was up to me to scratch build a new resonator and exhaust tip on my own. Not a difficult task; at its simplest it can just be one tube connected to a smaller tube, which is exactly what I intended to do. This would be a lot easier if I just had a plastic tube or pipe that was the appropriate size, but because I didn’t, I just wrapped a piece of thin pla plate up and filled the ends in. The tip was then made with a thinner pipe and glued on. Prepping the body parts for primer. The suspension and chassis for the base RX-7 were simple, so it was a quick matter to finish those up. Chassis already done. And I’ve barely gotten to the body yet. Thin coat of primer laid down before we start on the color coats. An interesting thing to note is that I actually never knew this body kit featured so many rivets – for most examples I’ve seen, they’re painted away in the body color, rather than left as exposed metal the way most modern body kits are done (I’m looking at you, Rocket Bunny owners). As much as I have the option of being as creative as I want with the colors and making it as unique as possible, I decided to stick to my Tokyo Drift fanboy roots and went with Han’s iconic sunset orange/black combo. I painted the black before the orange because it would be easier to mask the line edges this way. Normally I’d do black as the last color because darker colors going down first will affect the shade of the lighter colors being sprayed on top, but in this case I didn’t want to risk messy masking lines on a two-tone car. I could’ve just left the headlight housings without masking them, and painted them gloss black by hand with a brush after the rest of the body painting was done, but to avoid any thick layer buildup I decided to mask them anyway. I wasn’t about to attempt masking that housing the traditional way, so I just laid a piece of tape over it, made it conform, and cut the shape out. I need to use this method more often. See what I mean by it would’ve been easier masking the body with the side skirts off? Getting the tape to thread through the fender openings was a nightmare, but somehow it managed to work with some careful tweezer work. Rear diffuser wasn’t fun to mask either, what with those soft curves. To make sure the orange didn’t become burnt orange after I sprayed it, I primed everything again after the black parts had been masked off. Oh I love me some color. The sample model on EightyOne’s website actually shows the kit built with a much more saturated orange, which initially put me off. I had the choice between choosing a color like that or going with this lighter sunset orange, and depending on the lighting from the movie, either could be accurate. Literally the coolest thing peeling back the masking tape and seeing the iconic car take shape. Yes this orange borders on a dark yellow, but I think it represents the movie car better than the saturated sample model from EightyOne. Despite my earlier worries about getting clean lines when masking between the two-tone paint, a little bleed still happened. Thankfully I figured out a new and easy way to fix body color issues – decant a small amount of the spray paint into a disposable bottle cap and touch up the problem areas with a brush. The paint blended perfectly (as you’d expect it to, being the exact same and all) to the point where I can no longer tell where the bleeding was. I painted the wheels silver earlier with my standard silver paint, but I found myself wanting to keep the car even more movie-accurate, which means somehow getting chrome wheels. I had no idea chrome could even be achieved without an airbrush, so I was right about to count myself out of luck before the senpai at one of my local hobby shops introduced me to these magical markers – Motolov Liquid Chrome. It’s exactly what it says on the tin – liquid chrome in a paint pen. You shake it, press down the tip to release the liquid chrome, and apply it as you wish. I was skeptical that it would actually work well at first, but it yielded surprisingly impressive results. The paint is thick and tends to even fill in detail areas to the point where they don’t exist anymore (I lost a few lug nuts on the wheels when I first tried it, but thankfully this stuff seems to be alcohol based so it was a simple matter to strip it off and try again). It’s not as smooth as a sprayed finish is, but I liked the outcome. Apparently some guys decant this stuff and spray it through their airbrushes, which I imagine leads to some incredibly and smooth finishes. Gauge cluster in the dash was surprisingly made up of individual decals, rather than one large one. I’m super glad EightyOne also included a specialized decal sheet for the Fortune. It’s so hard to find VeilSide decals without purchasing an Aoshima VeilSide kit. I really liked the VeilSide seat decals, even though they’re technically Recaros and not the proper VeilSide D-1R’s that are used in the movie car. We can pretend, right? For the motor I decided to go with the RX-7 stock 13B, since I actually didn’t like the look of the very bare 26B. The 13B also gets the sick turbo hanging off the side and front mounted intercooler. The base Tamiya model didn’t originally include a motor, but the resin engine is designed to fit in the slots in the bay, so no modification is needed on that end. This setup looks good, but unfortunately it won’t be practical to run on the final model. For whatever reason, the intercooler piping bends don’t really line up properly to have the turbo’s exhaust side point downwards as it should, and they’re lined up in a way that makes the piping come up way too high, meaning we’re going to have hood clearance problems. The sample built motor from EightyOne had some neat silicone coupler replicas to join the intercooler piping. I wasn’t sure how I could best pull that off, but decided to give it a whack anyway with a thin blue rubber band I found around the house. Cut it, wrap it, glue it. The band is a little too thin to look proper or realistic, but admittedly this engine will be a bit of an afterthought to me; it won’t keep me up at night if it doesn’t look great at the end, since I’ll seldom be opening the hood. 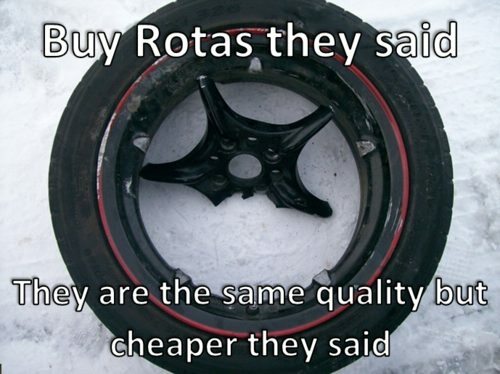 I don’t claim to be a rotary expert – in fact I know very little about them, and all the talk of their poor reliability and horrible fuel economy is enough to keep me away from ever committing to owning one. Just another one of their mysteries is why the rotary-powered RX-7’s radiator and intercooler are both supposed to be mounted at a horizontal angle up front. The radiator is molded into the chassis at a slant, while the piping for the resin intercooler indicate that it’s supposed to be near-flat in the engine bay. It’s so weird to me that the intercooler looks to just be suspended by the pipes, though I think that’s my fault for cutting off a bottom mount stand that I thought was flash. I went out of my way to paint that strut bar in metallic red and chrome, but at the end of the day it looks like it was a waste because the intercooler piping juts up so high that it gets in the way of mounting the bar at all. Taillight lenses painted clear red. I love this chrome. Its super reflective properties means it makes for a good bottom layer for clear parts. This looks ugly now but it’ll all be tidied up once parts and clear paint go on. A particularly jarring feature of this transkit that I noticed even on EightyOne’s sample built model is that the rear taillight bar seems to have extremely poor fitment. The seam where it joins the top of the bumper is extremely apparent. I attempted to remedy this by sanding and adjusting the taillight bar before painting, but there was only so much I could do when the problem was more inherent in the piece design and proportions. Wing mounted. These have got to be the thinnest pedestals I’ve ever worked with. They’re about as thick as a sheet of cardstock, meaning there isn’t much area to get them joined to the rear deck. It may be hard to make out here, but the clear headlight lenses are being test fit. They’re ever so slightly off, meaning certain edges have to be trimmed to make them fit properly. EightyOne gives us six individual clear headlight bulbs to slot into the housings. I’m almost surprised they didn’t take the precaution of including one or two extras in case we lost track of one – these things are microscopic and being clear, if you lose them it’s game over. The clear bulbs needed a little trimming here and there to fit into their housings, but overall it wasn’t a difficult ordeal. One part of this transkit that I really didn’t like were those atrociously bubbly mirrors. They’re oversized compared to the real car probably due to the limitations of resin casting, and if I wanted to modify them to make them slimmer it would require some serious cutting and sanding work. As a result, I decided to ditch them entirely in favor of the RX-7’s stock mirrors – which are much crisper and thankfully mount the same way. Sure, they don’t have the little cut groove in the mirror housing to allow for a black stripe on orange, but I decided to throw that all to the wind anyway by painting the entire things black. Sanding the finish with some 3000 grit sandpaper and polishing to bring out a better shine. The headlight lenses were actually a bit of a pain to situate correctly, even after I cut them down to fit. The clear plastic cement I use for clear parts doesn’t grab immediately, and the natural curve of the clear resin lenses kept pulling them up, so I had to use masking tape to hold the covers down while the cement cured. I actually didn’t realize until right before I put them on that the rear windows were supposed to go on the exterior of the body, rather than fill in from inside. Getting the windshield and side window pane in was a bit of a nightmare, mostly because there was so little surface area to mount the clear piece to the inside of the body shell. Tamiya designed it so that it’s literally a wrap-around clear pane, with the only contact areas where you could cement it being the super thin A-pillars or the bottom edge of the side windows. If they had just added a clear panel to mate with the roof, this wouldn’t be a problem. I needed a thick instant adhesive that would hold the windows in without fogging them as Crazy Glue tends to do. My crazy solution: hot glue. I’ve never used hot glue on model kits before, and it seems like heresy to even entertain the thought, but the more I thought about it the more it made sense – why not use hot glue when it was a thick instant adhesive that would be able to hold the windshield in? Spoilers: it worked. Added some mesh into the front bumper grille. Wheels attached; ready for the body. Keep in mind the offset for these wheels are just absolutely bonkers because of how wide the transkit body is. I made no adjustments to the suspension whatsoever because I figured EightyOne designed this transkit to work without any. Upon smashing carefully sliding the body shell on, I immediately noticed a fitment issue: the front really didn’t have an area to clip together, so the chassis was loose and moving around under the fenders. This caused the front wheel fitments to look borked, since if the chassis and body weren’t mated, there would be some atrocious wheel gap. Because there wasn’t really an area that I could easily access to add Crazy Glue or cement to join the chassis and body, I opted for my newfound solution: hold the chassis and body together, and dump some crazy glue into the fenders to keep them mated. It worked. With the front wheels sitting flush thanks to that fix, we were introduced with a new problem: the engine, which was attached to the chassis, is now pushed way too high up, so it goes over the front fenders and therefore prevents the hood from closing properly. So the intercooler piping needs to be completely torn down, trimmed at different angles, and re-inserted in a way that would allow hood clearance. Such is the way of model building: you fix one problem only to find that it creates another. So, tear it apart I did, and rebuild it I did. But in the quest for plumping fitment, I ended up borking the actual intercooler fitment. Now it’s all hung slanted and unevenly; it should be straight and near-flat, but due to the weird bend of the pipes that ran from the turbo, the only way I could fit the intercooler was to have it slanted. That’s not a problem I’m willing to fix anymore. But hey, hood’s flat! You’ll never even know how fucked the intercooler is if you never take off that perfectly flush hood. You may have noticed in the pictures prior that the car’s finish is slowly deteriorating and getting more gross because I keep handling it to get the body mounted and work on the engine. To bring the smooth shine back and get rid of my gnarly fingerprints, I decided to try using some actual car wax – the same stuff I should be using on my real car more often. I’ve read that this is common practice for modelers, but somehow it never struck me to try it until now. Another minor issue with the wheel fitment was with the rears this time – the offset was just a little too aggressive, so they poked a bit more than I would’ve liked. It’s only a tiny variance, but it bothered me enough. My solution was to cut the hubs on the back of the wheels off, but when I did that, the spokes got in the way of the brakes, so I had to make a little hub spacer to make sure the wheels mounted evenly. It’s okay; it’s fixable. I cut a bit of the tire too when I was going in so hard, but thankfully that won’t be seen once the wheel’s mounted. I like this fitment a lot more. The EightyOne sample kit had a much lower ride height and stanced wheels, but I thought this car looked better without being slammed. Besides the movie car having a ride height about to where this is, it’s also pretty obvious that this entire body kit would be scrapped instantly on the public road if you slammed the suspension. The car’s now done, but the build isn’t. I normally wouldn’t bother with human figures, and I would rather not have anyone in the drivers seats, but for a car as special as the Fortune I thought it appropriate to make an exception and have it on display with its most iconic driver – Han himself. This is an aftermarket resin figure, similar to the actual Fortune transkit being aftermarket resin. However, it’s not from the same company – rather than EightyOne, this 1/24 Han comes from Hobby Design, a very upscale and popular aftermarket resin parts producer for model cars. Their stuff is usually as expensive as resin parts get, with their out-of-print kits being either completely impossible to find anymore or outrageously inflated on eBay. I can see the quality difference in resin though, and this isn’t even a car parts set. The resin Han is molded from seems to be crisper for the fine details, with no random excess flash other than the main nubs. Given how small this figure is, I thought it best to just do the entire thing by hand rather than waste any time and resources spray painting it. Starting with a custom flesh tone mix for the face. I’m basing Han’s outfit color on his appearance in Tokyo Drift during the scenes when he picks up Sean from school (yes I studied the movie frames for his outfit details). I’ve seen other modelers paint these figures in whatever colors suited their whim, but since I built a mostly-movie accurate Fortune, I thought I might as well keep everything as faithful to the silver screen as possible. Han’s sweater that he’s wearing under his jacket (this guy’s seriously bundled up) looked to be a green camo in the film, so to replicate that effect I took some forest green acrylic and dripped a bit of pewter gray in. The paint was then lightly stirred to mix the colors, though not enough to create a new pigment. Just enough to get a swirl of colors on the brush, which was then directly applied to the resin, creating a pseudo-camo effect. It didn’t actually turn out as nice as I had hoped due to the paint mixing a bit too much, but I can live with it. Outer jacket was just navy. A custom mix of gray and green was used again for the pants, which looked to be mossy khaki in the film; it was hard to make out but I think I got close here. In any case the outfit color breakup looks pretty believable. I know opinions on this kit are polarizing; some think it’s a disgrace to the RX-7’s original classic lines, while others are very on board with the supercar looks. I’m obviously in the latter camp. Make no mistake, I love the original RX-7 and Takahashi Keisuke is my hero, but I’ve always liked clean body kits that significantly change up a car’s appearance. EightyOne’s resin quality actually didn’t impress me very much – maybe it was the opaque finish of the parts that made it look less crisp, but even with my lack of significant experience working with resin, these parts had way more flash than normal. I actually only realized after I finished the build that I overlooked a crucial area – the inside bottom of the sideskirts weren’t sanded down, so the jagged resin casting is still on full display there. It’s a massive eyesore, but fixing it would require ripping apart the sideskirts, sanding them, and repainting everything to make sure the body paint matched. Needless to say that’s out of the question, so I’ll just have to live with the imperfections. The final paint finish also isn’t quite where I wanted it to be; I actually realized during assembly that I should’ve let the color and clear coats cure for another day or two. The paint was still slightly soft so it was giving way under my fingers, messing up some of the gloss in certain areas. Despite my criticism for the molding and finish of some of EightyOne’s parts though, I have to admit that most of it actually fits pretty well, given that it’s a complete body shell replacement. I was fully prepared to deal with janky body fitment on the chassis, since even factory kits with original plastic bodies have those issues sometimes. To my pleasant surprise, that wasn’t an issue here – they were good about keeping the mounting point in the rear bumper lined up properly to how the body should sit. It’s also a bit of a weird move for EightyOne to include the side marker lights and rear bumper side reflectors as part of the body mold. I do think those areas could have benefited from clear part inserts, but my own skills are also partially to blame, as I’m sure a more advanced modeler could’ve made them look much better than my attempts at metallic red. The car’s width is super apparent when viewed from the bottom. The sheer thickness of the sideskirts just make the whole thing look more boat than automobile. The taillight bar fitment can be adequately described as atrocious, but I take solace in the fact that EightyOne’s own sample model was arguably worse, and I didn’t want to screw with the resin any more than I needed to to get a flush fitment out of it. The engine bay isn’t pretty either. I realize now that I’m being unusually harsh on this build, but for a halo car that I’ve always admired I wish I had the skills to have built it better. The rubber band couplers aren’t very impressive, though I suppose it looks better than pipe seams. That strut bar that I couldn’t fit in here would’ve really brightened the bay up a lot, I think. Instead I ended up with a bland silver motor with a crooked intercooler and wonky piping. I promise my next motor will be better. I’m sad at this attempt, but also won’t linger on it because I probably won’t take the hood off again and I was never attached to rotaries anyway. The detailed turbo with the exposed turbine is cool though. And finally, the look I’ve been going for – paired up with a proper driver. I was actually going to leave Han’s eyes and face blank with just flesh tone, rather than coloring in any of his facial features. That’s how I’ve always done it with Gunpla pilot figures, and it generally looked alright. I thought it was better to just leave it all flesh tone rather than screw up trying to add eyes and get a creepy effect going. I’ve seen model masters paint in the faces on these figures before (although they were the 1/18 scale figures, which are larger, rather than the 1/24 Han I have here) but even those done by professionals only looked mediocre. None of them really looked like Han, probably due more to the slightly off-kilter face mold more than the painting techniques used. Still, at the encouraging of a friend to give eye painting a shot, I decided to just go in and do it. The whites in the eyes were painted in with a toothpick, while the pupils and eyebrows were drawn in with a thin pen. It sounds simple, but keeping a steady hand is crucial lest you end up with a cross-eyed Han. I like the final result. Yeah, it doesn’t look very realistic especially because I’m not good enough to shade the area around the eyes to give the face any depth, but at the very least it looks presentable (I think). I didn’t mention it before, but I’m a fan of the pose Hobby Design chose for their Han figure. It befits his in-universe personality of being laid back 24/7. With this pose though, it’s actually fairly difficult to get him to stand upright properly. Because he’s basically balanced on one foot, I had to add masking tape to the underside to make sure the foot stuck to the ground when leaning his body on the car. I don’t think I did poorly for my first resin transkit, but I suppose it’s a bit of sad irony that such a cool car like the Fortune had to be the one that fell on the cutting board of my inexperience. As for EightyOne’s parts quality in resin, I’d say they aren’t bad, but there are clearly companies that produce crisper molds and make the resin cleanup process much easier on modelers. They are the only ones who produce certain body kits and transkits like the Fortune and Bensopra GT-R though, so that’s reason enough that I’ll continue buying from them.